Milan, the Italian city of fashion and shopping, without the beauty of Italian cities such as Rome, Florence or Venice, is interesting enough and has the attractions to spend at least a weekend. The icon of the city is the Duomo, with a white marble facade and bronze doors, located in the list of the most beautiful cathedrals in the world. Another place you cannot miss is a visit to the Church of Santa Maria delle Grazie to see The Last Supper, one of the masterpieces of Leonardo da Vinci. If you have more days, near Milan in a northerly direction, you will find the area of the lakes of Lombardy with the beautiful Lake Como and the Swiss Alps. In a southerly direction, towards the Mediterranean Coast you can reach the beautiful Cinque Terre villages in a short time. Based on the days we spent in the city on our trip to Milan and Bergamo in 4 days and surroundings, we have compiled a list of what we believe are the 5 best tours and excursions in Milan in Spanish. 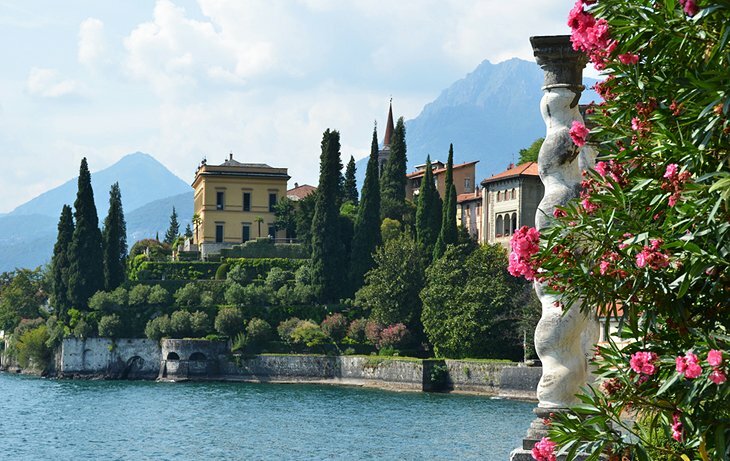 Lago di Como is one of the most beautiful lakes in Europe and one of the most amazing places to see in Italy. This lake of glacial origin, which was already very popular before George Clooney bought a house there, is perfect to enjoy a destination, surrounded by mountains and leafy nature, dotted with beautiful villages and villas on its banks, which has become in one of the places chosen by many Italians and tourists to spend a dream vacation. The best way to tour the lake is by boat from the city of Como, from where you can go down in the most beautiful villages such as Bellagio, Varenna, Nesso, Tremezzo and Menaggio or the luxurious villas of Balbianello and Carlota. If you have a car you can go around the lake and stop at its villages and viewpoints, although the road is narrow and with many curves, it is another option that is worth it, to see the area from another perspective. We visit Lake Como from Milan, renting a car, but if you do not want to drive you can go by train in less than an hour. A good option, if you do not have much time, is to book a day trip Milan to Lake Como with a guide in Spanish, which is also one of the best excursions in Milan in Spanish. Cinque Terre is a beautiful Italian coastal area with five picturesque villages located between cliffs and mountains, declared World Heritage by UNESCO. The gateway to this area is from the city of La Spezia by train or from the port of Portovenere by boat. Monterosso is its largest town, which also has more hotel infrastructure and more affordable prices, so this was the main reason to stay here on our trip to Cinque Terre. From Monterosso you can make a hiking trail among olive trees, vineyards, cliffs and viewpoints to the sea, until you reach the town of Vernazza, one of the most beautiful in this area. Corniglia is the oldest town and the only one that has no access to the sea, so the best option to get to this one is by train. Riomaggiore and Manarola , the last two villages of the Cinque Terre, connected by the Via del Amor, a kilometer-long coastal path, which is currently closed, are by postcard and our favorites, since they are full of charming corners that You will fall in love while you walk through its streets. Even if you visit the villages by train, it is essential to save a few hours to take a boat trip along the coast to have the best perspective of the Cinque Terre, from where you can enjoy the incredible landscapes from the water. To get to Cinque Terre from Milan you can rent a car or travel by train to La Spezia, from where the journey takes about 3 hours in both cases. Another good option if you have little time and do not want to rent a car is to book a tour by bus to Portovenere and then take the boat to see the villages of Cinque Terre. There are many things to do in Milan, the capital of Italian fashion, in addition to shopping for its countless shops and shopping centers. The most prominent place in the city is the Duomo Square with its fantastic cathedral, which is essential to climb its roof, and Galleria Vittorio Emanuele II. Near this square you will find most of the city's attractions such as the Teatro alla Scala, one of the most famous in the world, Piazza Mercanti, the Pinacoteca di Brera or the Sforzesco Castle, one of the places to visit in Milan essential. Another place you can not miss, although you do not like shopping, is the Quadrilatero d'Oro, where you will find the most expensive and luxurious shops of the most famous designers of Italy. Our favorite place in Milan, together with the Duomo, is the church of Santa Maria delle Grazie, where one of the masterpieces of the history of art, Leonardo da Vinci's Last Supper, can be found. This work that is in a fragile state of conservation can only be visited by booking well in advance, since its access is restricted to few visits during the day. All these places can be seen on your own, although it is interesting, if it's your first time in Milan, book a visit with a guide in Spanish to better know the history of your points of interest and make sure to check in to see The Last Supper.